American voters are tired of politics as usual. They want leaders that will put their country before their party, and American interests before special interests. Leaders who will work together to develop fresh solutions to the serious challenges facing our country. We believe a secure, online nominating process will prove that America is ready for a competitive, nonpartisan ticket. Define the crucial issues facing our nation—beyond just red and blue. Americans Elect is already well on the way to putting the first directly-nominated nonpartisan ticket on the 2012 ballot in all 50 states. As the debt ceiling / US budget theatrics continue in Washington (prediction - compromises coming in a few days to avert an S&P downgrade) , the race for the Republican presidential nomination continues in a somewhat lackluster fashion with several potential candidates on the sidelines waiting to see if they can muster enough support to throw their hat into the ring. However Republicans must be concerned that none of the current crop appear likely to defeat Obama unless the economy suffers significantly greater setbacks in the next year. It's alarming to think that some radical Republicans may have this scenario in mind as they continue to stall on budget compromises and raising the debt ceiling, hoping to harm the economy enough to defeat Obama but not enough to send us into a tailspin. That calculation would not only be unpatriotic, it would be potentially disastrous for the country. The current best bet appears to be that Mitt Romney will sort of plod into the Republican nomination with Michelle Bachmann pulling in the Tea Party folks, leaving moderate Republicans a choice between Rick Perry and Mitt Romney who are polling about equally in scenarios where Perry's in the ring (he has not announced yet but is very likely to do so if his numbers stay as high as now. RealClearPolitics has Romney at 18%, Perry at 17% in a race where all the strong potential candidates are placed in the ring. With only *announced* candidates, Romney's in a strong lead at 27% with Bachmann second with 18% , Ron Paul third with 11%. Look for Palin to stay out of the race and hope for a VP spot on the likely Romney or Perry ticket. Look for Bachmann to *get* the VP spot on the Romney or Perry ticket, giving the Republicans a similar strategy to McCain / Palin but with much stronger candidates on the ticket. In our view Obama's still in the driver's seat with respect to the 2012 election. Barring a serious economic setback, Americans are unlikely to want yet another major "change" in the White House so soon. Obama's kept his core constituency happy with only modest levels of alienation of those on the far left who naively felt Obama as President would act very consistently with Obama as young Chicago organizer. We're likely to see more liberal "progressive" politics from Obama in a second term, but it's clear that President Obama will continue to keep moderate democrats fairly happy while he continues to alienate the far left and right. It's a great political strategy and it won't change for the 2012 election. Over at Travel and History I've written a short "History of the Democratic Party", focusing mostly on presidents and briefly tracing the history of the democratic party from inception in the late 1700s to modern times with the election of our latest Democratic President, Barack Obama, who coincidentally just released a better copy of his birth certificate ... today. 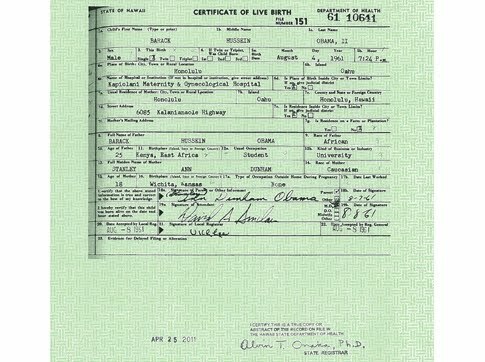 Although the "birther"arguments have always been pretty dumb, it was also been odd that the Obama camp worked so hard to avoid releasing the "vault copy" or original certificate. My working hypothesis about that was that the original birth certificate probably was lost or defaced or contained something compromising which might have made greater trouble than simply stonewalling, but the release of this latest long form birth certificate official copy from Hawaii suggests that was wrong and there was nothing at all to hide. One would think the Obama election team would have waited until closer to the election to let the frothy nonsense continue, so perhaps they have decided this was eating into his popularity enough that waiting any longer was unwise. In any case, it looks like the 2012 Presidential Election will now be pretty much in full swing, though as David Brooks suggested recently it's very hard to imagine anybody in the current field of candidates giving Obama much of a run. I think Romney is the most likely nominee and arguably has a shot, but a lot can happen in the coming months as Republicans work the dreary Iowa farms and fields to line up early support, effectively copying the brilliant strategy of the Obama 2008 early campaign juggernaut. Obama v. Romney in 2012 ? As the Republican presidential primary contenders start to shake out from the field of many to a few, two names seem to stand out conspicuously: Donald Trump and Mitt Romney. Readers of President Picker will note that we thought Romney would win last election's Republican Primary, and we'll stick with that prediction for this one. McCain's nomination and predictably weak candidacy was a surprise to us though the outcome was not. Romney is a far more formidable opponent to Obama, and we'll see a close 2012 race if he's the nominee, a race that will reflect the increasing level of political polarization in the USA. The other conspicuous Republican is Donald Trump, the bombastic star of real estate and TV. It's remarkable to see how well Trump's doing right now in polling, though most likely this simply reflects the growing frustration with America's arguably obsolete two party focus - a system that largely requires a tribal approach to thinking and politics rather than the flexible and compromising strategies that would serve us better. The new political landscape. Stay Tuned. As the Republicans take control of congress and the Tea Party starts to weild real power, the American Political landscape will again change. Too many analysts seem confused by what is wrongly perceived as a shift in the way people view big government. Obama's election was not an endorsement of big government - rather it reflected the powerful desire on the part of the public for new people and new approaches. In some ways the electorate is "experimenting" with politicians - bringing in new ones until they find something they like. Dissatisfaction with GW Bush and the feeling that neither Hilary Clinton nor John McCain would bring new and inspired innovation and leadership largely account for Obama's win. Those factors were probably more important than his own policies. In many ways the "seesaw" Democracy we have is inefficient, but it does serve to change the game. Unfortunately we don't see this in the congress and Senate. Founders such as Franklin and Jefferson generally advised in favor of term limits but these rules were only constitutionalized for the office of the Presidency. What's in store? If events immediately preceding the elections are any indication, Obama may continue to find ways to cooperate and compromise to avoid the gridlock many are predicting. Was Obama to some extent handicapped by Democrats control of the congress which forced him to support fiscally questionable policy making? Now in power, will Tea Party folks continue to fight for the strident conservative spending principles of their campaign?